Room number eight is located in a nondescript corner of the All India Institute of Medical Sciences (aiims), New Delhi. Gauri Prasad regularly visits this room, which stores medical histories of cancer patients. A resident of Panipat, Haryana, Prasad has been afflicted with lymphoma for the past five years. Now in his third relapse, he wonders why the killer keeps resurfacing even though he has undergone chemotherapy twice. The stacks of files inside the room mean nothing to Prasad's oncologist. "I have treated thousands of patients. Yet I know so little," he says. The story repeats itself in hundreds of hospitals across India. "There are typical questions a patient invariably asks," says Rajeev Agarwal, a surgical oncologist at Sir Ganga Ram Hospital, New Delhi.Why do I have the disease? How long will I live and how much would I have to spend? A nation with a billion people knows very little about the killer though arguably there are one billion reasons to find out. Desperately. Yet the medical establishment can't even pin point how many people are killed by cancer. 'One of the top ten killers,' an uncertain government document will inform you. With the cancer registries making cold entries of cancer patients into thick registers, since 1982, Indian medical bureaucracy's understanding of the disease has almost come to an end. Way back in 1975 a National Cancer Control Programme (nccp) was set up recognising the emergence of the deadly killer. It is frightening to note that 27 years later the programme remains baffled and static as it fails to generate a comprehensive data bank of the disease, which can give vital clues to understand cancer. The National Cancer Registry Programme (ncrp), coordinated by the Indian Council of Medical Research (icmr), New Delhi, has brought out just seven registry reports though it was established more than two decades ago. The last report was published in 1992 for the year 1988-89. And even these are very rudimentary, revealing just the tip of the iceberg. 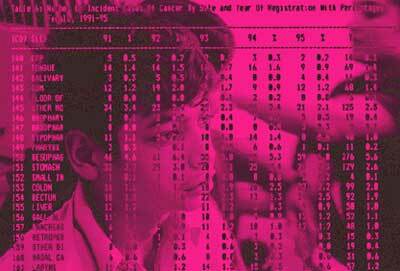 icmr plans to publish the next set of data only in January 2002 -- after an entire decade. In a sadistic display of insensitivity, information of cancer registries are never shared, crippling future research. Even sister agencies find it difficult to access this information. Like cancer, the system remains stubborn. Most doctors say that information collected by ncrp is vital to check the rising incidence of cancer. "We need information to find out the reasons of its occurrence and ways of controlling it," says Vinod Kochupillai, chief of Institute Rotary Cancer Hospital (irch) at aiims. It helps me find out 'why' I get these patients, says Praful Desai, former director of Tata Memorial Centre (tmc), Mumbai. Providing the best treatment largely depends on information on 'what' works best and in 'which' conditions, says Arun Goel, consultant surgical oncologist, Dharamshila Cancer Hospital and Research Centre, Delhi. "Had curing one patient been our aim, we wouldn't have needed data," he says. "It is believed that breast cancer is on the rise in Delhi, but there is no data to support this fear," he adds. "The data would help to determine the infrastructure needed to cater to the number of patients," says D N Rao, head, department of epidemiology, biostatistics and medical records, tmc. The government realised the importance of collecting information on the incidence of cancer as early as 1965 when the then director-general of health services, K N Rao's Cancer Assessment Committee, did a cancer assessment and suggested the setting up of a National Cancer Registry Programme (ncrp). Along with providing morbidity and mortality figures, the cancer registries were supposed to study the distribution of cancer in different parts of the country. But the government sat on the Rao committee recommendations. In 1972, the then director-general, icmr, P N Wahi's Cancer Assessment Committee once again recommended a nationwide registry. Finally, in 1982, the ncrp was established -- 17 years after it was first recommended . Two types of registries were started in the country. The Population Based Cancer Registry (pbcr), which would provide information about the trends in the disease in an area and the Hospital-based Cancer Registry (hbcr), which would provide information about the stage at which the patient came to the hospital and the treatment administered. While icmr funds six pbcrs and five hbcrs, the others are managed privately. This is how a pbcr supposedly works : it identifies hospitals , private practitioners and pathology labs where cancer cases are diagnosed. Its field workers then gather information from the patients' records and also meet the patients. pbcr then codes the data according to international standards, analyses it and at the end of the year sends it to icmr. The system looks too good to be true. But obviously something is amiss in the system -- icmr's last report was published in 1992 containing 13-year-old data. In between the idea and the reality falls the grim shadow of neglect. The process also has built in loopholes. For example, what happens if a patient of Kolkata comes to Mumbai for treatment and gives his local guardian's address? His record could end up in the Mumbai data and inflate figures. It could also not reflect the status of cancer in Kolkata. Such errors can be minimised if the methodology in usa is followed. When a cancer patient goes to a doctor, it is the responsibility of the doctor to report the case to the National Program of Cancer Registries, usa. A legislation for the doctor and social security for the patient ensures the methodology is followed religiously. But of course, it happens only in the us. Just what does cancer data tell? It is impossible to get data on cancer. icmr and most of its registries seem like impenetrable fortresses of 'knowledge'. The chief of Delhi Cancer Registry believed sharing of information was a waste of time. Exasperated, Down To Earth's correspondent travelled to Mumbai and was able to lay her hands on limited data for Maharashtra -- some official and the rest generated by non-governmental organisations. A similar journey to Thiruvananthapuram gave a little more data. The dozens of doctors she met, the numerous hospitals and institutions she did the rounds makes one shudder at how helpless an individual trying to ferret out information on cancer in India could be. But why is data on cancer important? Preventive strategies require a knowledge base of trends in incidence rates. To generate such trends a series of data collected over time and spatial distribution is a basic prerequisite. Unfortunately, the data that the National Cancer Registry Programme (ncrp) provides is too patchy. Arun Goel, consultant surgical oncologist at Dharmshila Cancer Hospital and Research Centre, Delhi helped Down To Earth to make sense out of the latest information available. The most conclusive inference one can draw is that consumption of tobacco is linked to five of the top ten cancers among men in Mumbai, Nagpur, Delhi, Kolkata and Thiruvananthapuram. In Pune and Chennai, six of the top ten are tobacco-related. This is in conformity with the global trends. A closer look at the tobacco-related cancers reveals another significant pattern: oesophageal cancer incidence is significantly influenced by factors besides tobacco consumption. This is revealed by the fact that incidence rates of cancers of larynx in men vary by nearly 200 per cent over various cities while the variation in the rate of incidence in case of oesophageal cancer is nearly 400 per cent. Stomach cancer also shows big difference across the country: it is common in Chennai. Mumbai, Pune and Nagpur are also seen to have higher incidence than Thiruvananthapuram. It is believed that stomach cancer is common in southern India due to its spicy food. But further research needs to be done to identify the causal factors. The cancers affecting men and women too show a varying trend. In women, cancer of the uterine cervix, which can be easily prevented by awareness, is the most common. Breast cancer too is on the rise. This trend is likely to be seen in other urban areas and, to a lesser extent, afflict the rural population as well. Cancer of the gall bladder is common in women in the North. It is the third-most common cancer in the Delhi cancer registry. One risk factor for gall bladder cancers is gall stone disease, which too is recorded higher in the northern parts of the country. However, other factors that are likely to contribute to occurrence of gall bladder cancer have not been identified yet. Sadly the focus of cancer prevention is only on the top cancers, which have remained constant over the years. There has not been much attention paid to cancers that may not be on the top ten, but are steadily rising.